The chemical composition of zircons from lithium-fluorine granite of the Severny pluton in the Chaun region, Chukchi Peninsula, has been studied. The magmatic origin of zircons has been established. Elevated LREE, Li, and Nb contents; moderate enrichment in Hf; and deep Eu anomalies are characteristic of zircons from rare-metal granite. The contents and distribution of chemical elements in studied zircons differ from those of biotite granite. Zircons from lithium-fluorine granite of the Severny pluton also differ from the worldwide analogs in moderate Hf, Y, and REE concentrations and extremely low contents of U, Th, and other incompatible elements. Original Russian Text © V.I. Alekseev, Yu.B. Marin, S.G. Skublov, I.M. 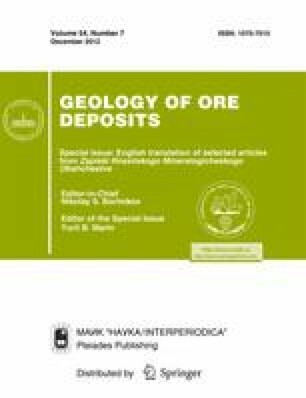 Gembitskaya, 2011, published in Zapiski Rossiiskogo Mineralogicheskogo Obshchestva, 2011, No. 3, pp. 87-93.